So it’s been a cool few days with the rain beating down hard and despite getting stuck outside for a few minutes one day, you think you’ve weathered the storm. Suddenly, you wake up one morning with a sore throat, which is only an introduction to the blocked nose, sniffing, sneezing and coughing. Finally, reality dawns that you’ve caught a cold or flu, one of the few illnesses without a straight out cure. Common cold can’t kill but it can make one super uncomfortable and complications can lead to other ailments. However, it’s not all doom and gloom because you can find quick relief and knock off that cold or flu with these smart moves. During the course of an illness, the body works hard to fight off the infection and get better. As a result, it needs all the energy it can get so don’t become your own enemy by competing with your body for energy. Make rest and recovery from that cold or flu your priority and stay home till you feel better. You can never go wrong with a mug of tea or hot chocolate in this case. Research shows that the heat can also ease cold or flu symptoms such as sore throat and fatigue. A hot shower, chicken soup or lemon water also works. Just avoid coffee – for the time being, and please, stay clear of cold-air conditioned places too. Sounds cliché but getting plenty of fluids thin your mucus and breaks up nasal congestion. It also prevents the headaches and fatigue that dehydration causes. Stick to water though, caffeinated drinks can be counterproductive in this case. Gargling with warm salt water is a good way to soothe a throbbing throat as it eases swelling and loosens mucus. All you need is one-half of a teaspoon of salt into a cup of warm water. Just gargle a few times a day and you’ll be better in no time. So there you are. 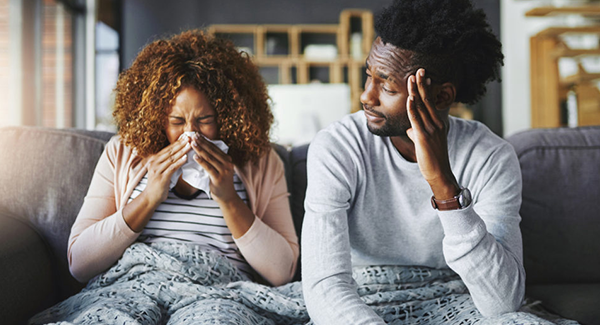 It’s better to be clear of an infection but just in case there’s one, you now know what to do to speed up your recovery outside taking certain over-the-counter medications.